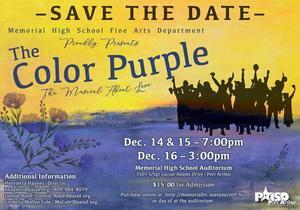 MHS Fine Arts Department to Debut "The Color Purple"
The Memorial High School Fine Arts Department will debut the critically acclaimed musical, “The Color Purple,” on December 14-15th at 7 p.m. and December 16th at 3 p.m. in the Memorial High School auditorium. Tickets are $15 and can be purchased online at: http://memorialhs.seatyourself.biz or on the day of event at the high school. Doors will open at 6:30 p.m. and the musical will begin promptly at 7 p.m. on the 14th and 15th. Doors will open at 2:30 p.m. and the musical will begin promptly at 3 p.m. on the 16th.